A teacher wall is a variant of the storage wall modular system, combining storage and technology to create a modern, streamlined learning aid. TeacherWalls are also known as teaching walls or teacher walls. TeacherWall can provide a complete storage, IT and teaching solution for the classroom. TeacherWalls are not only used in classrooms, but also in IT suites, food technology rooms and science laboratories. Whiteboards are incorporated into the TeacherWall, often combining an interactive whiteboard and sliding drywipe boards as shown. The projector for the interactive whiteboard can be fixed to the TeacherWall. A storage wall is a flexible and creative fitted storage system that is configured to create a bespoke solution for any space or requirement you may have. This type of storage is commonly used in commercial and educational environments where its ability to provide space-saving storage solutions makes it an increasingly popular choice by many of our customers. StorageWall can be customised to individual requirements, including variations of sizes, internal fittings, colours, door types, materials and locks, as detailed below. Our StorageWall system is so versatile that it can be used in a wide number of settings, enhancing the appearance of a room and providing a bespoke storage solution. 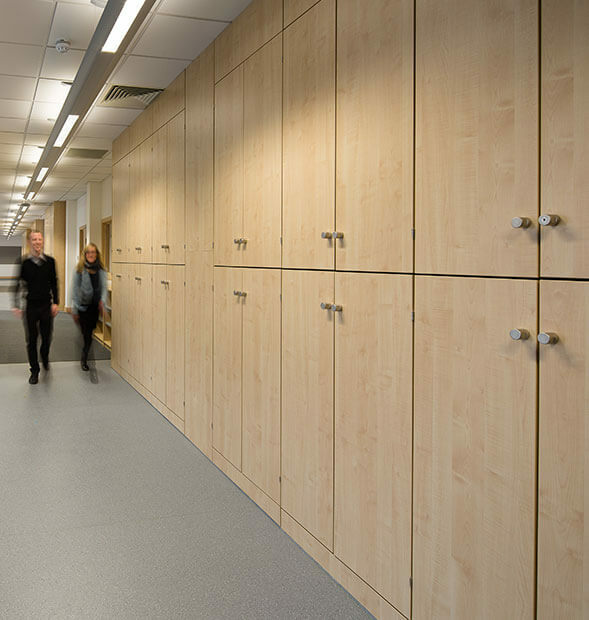 Both TeacherWall and StorageWall can be customised to suit your needs, whatever the height, width or use of the room. The finishes, internals, locks, doors, size and shape of a teaching wall can all be adapted to each individual client. This modular system enables you to purchase a storage solution bespoke to your needs without the cost traditionally associated with bespoke furniture. 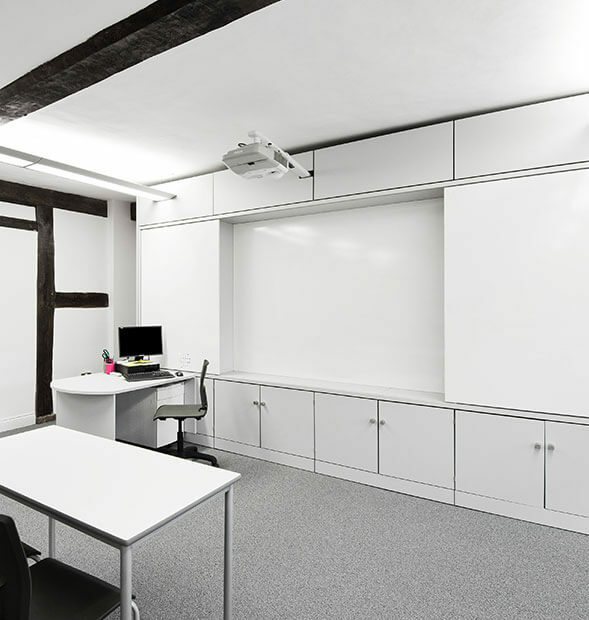 StorageWalls can be used as a partitioning option for offices and schools, or as half-height dividers, thus combining storage with a practical and money-saving solution. These systems are versatile, timeless and convenient. StorageWall is very flexible and has a wide range of internal fittings and additions to suit every application. These include: pigeonholes, retractable teachers stations, suspension filing, shelves, pull-out filing drawers, whiteboards, coat rails, lockers, Gratnell trays, even the kitchen sink! TeacherWalls and StorageWalls are constructed from MFC panels which are available in a wide range of finishes and colours. There are a wide variety of woodgrains as well as plain colours and our storage can be installed in veneered wood. 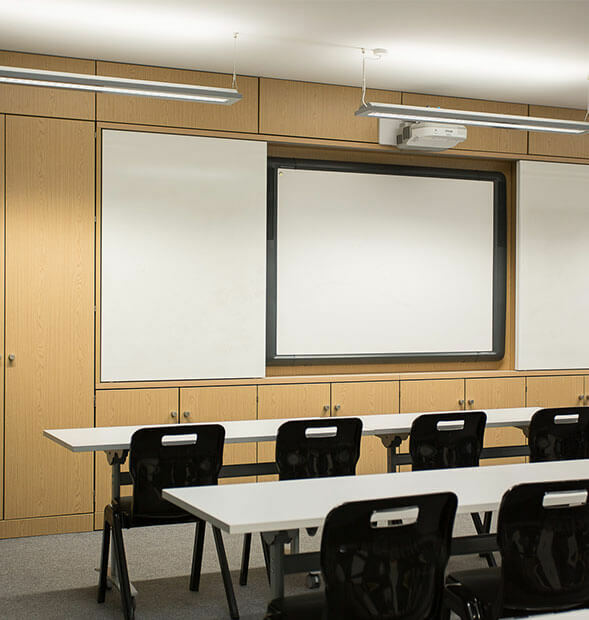 Whiteboard material is a popular choice for TeacherWall doors as it enables them to be used to their full extent in a learning environment, as well as pinnable material. A StorageWall with lockers (which we call LockerWall), may have doors made from SGL for extra durability. Glass doors can be used to display school trophies or pupil work in a showcase style. Lighting, graphics and lettering can all turn a StorageWall into a unique design feature, making it a focal point of the room. Sliding doors – Most commonly used for sliding whiteboards on a TeacherWall, they are also popular in hallways as hinged doors may create congestion and restrict passing space. Hinged doors – This is the prevalent door type, used for most full-height and half-height cupboards, as well as lockers. Tambour doors – This door type is popular for use in offices as they do not take up any room when open and are therefore very beneficial for compact rooms. Cam lock – This is a key operated lock. Locks can be set up so that all the units have the same key, or all units keyed to differ, or a different key per room with options for master keys. Hasp and staple lock – A fastener that is secured with a padlock. Combination lock – This uses a combination of numbers to unlock (pictured). It is re-programmable for security and when the locker user changes. Digital lock – An electronic locking device with a keypad that unlocks with a 4 digit code. This can also have a one-time usage program for changing rooms and multi-user applications.